Max Chilton, who says he still feels like a rookie around the Indianapolis Motor Speedway, and Ed Jones, who is a rookie, led the way in Monday's manic four-hour practice period that saw all 33 drivers in action. Chilton, who lines up 15th for Sunday's 101st Indianapolis 500, took advantage of the conga line of drafting to post the top speed of 228.592mph in the No. 8 Chip Ganassi Racing Gallagher Honda. "The day flew by but it was good, " said Chilton, the ex-Formula 1 driver in his second season of IndyCar racing. "I don't think anyone is overly happy with their car in traffic but in clean air I'm OK.
"I still feel like a rookie, learning the feedback, but I'm thankful to have such a good car." 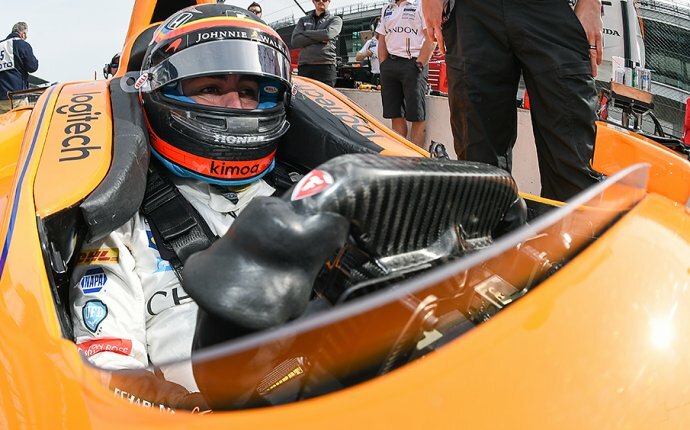 Jones, who qualified 11th for his first Indy 500, continued to impress in Dale Coyne's Honda and was the only other driver over 228mph (228.118); pole-sitter Scott Dixon ran 227.165mph in his Honda. Rookie Jack Harvey posted the fastest non-tow speed of 224.6 in his No. 50 Michael Shank Racing with Andretti Autosport Honda. Oriol Servia lost an engine in his Rahal Letterman Lanigan Honda but was getting a new one for the race along with everyone else except Fernando Alonso, James Davison and any of the May-only competitors. Davison, replacing the injured Sebastien Bourdais, quickly reached 223mph in Dale Coyne's Honda. "It's a road race backup car and we're aware of our situation, " said Davison, a two-time Indy starter whose last appearance was in 2015. "We're just trying to get the cars handling with a lot of traffic because there's obviously going to be a lot of that in front of us since we're starting last."